My friend Tara and her husband Andy are one talented duo. Their blog showcases gorgeous photos of their home, children, and many of their hand painted signs. I have 2 of their signs. but you will just have to wait to see it later this week. Can you guess which one I have? They are all so good, it was really hard to choose! Please visit their etsy shop and let me know which one you would choose. Also, you do not need to have a blog to enter. Just be sure to leave me your email address so I can contact you if you are the lucky winner. I will pick a winner via random.org and announce it back here on Friday! And on a side note~I will be updating my etsy shop today. Stop by soon for the best selection! I Love the Have yourself a Merry little Christmas Sign!!!!!!!!!! Love the new pix of your home. Would love it on my mantel. I just love the "You have my whole heart for my whole life" sign! I just got married in May so that's appropriate, right? Thanks for the chance to win! JOY TO THE WORLD in red! I love this one! would look great in my foyer or breakfast room or beside my front door!!!!!! I really love the Family Rules sign, just the way they have it! thanks! Ok, I just read where it's a CHRISTMAS sign giveaway. Sorry! In that case, I love the O Holy Night! Love the Red Joy to the World! Thanks for the great give a way. Love the Have yourself a Merry little Christmas Sign!! Their work is beautiful! 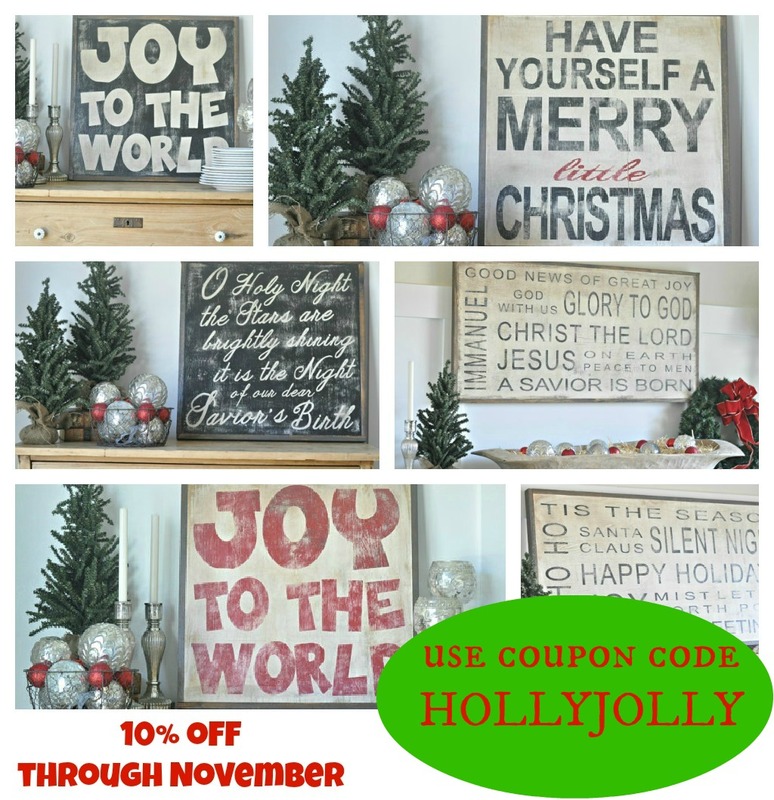 I would love to add the Joy to the World sign to our Christmas decor. O Holy Night is my favorite Christmas sign. So pretty in black and white. Merry Little Christmas Sign, so sweet and just a dash of color. Love it! i love the merry little christmas sign! I would choose either a scripture sign or the Sunshine sign. It would look so beautiful above my mantel. I love the O Holy Night! I love the Joy to the World sign! I pinned it on Pinterest a long time ago. It would look perfect on my fireplace mantel. Thanks for the chance at this wonderful giveaway! Joy to the World is a great sign and caught my eye right off! 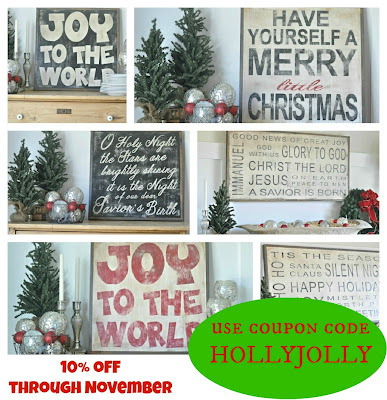 They are all beautiful but I would personally love the "O Holy Night" sign! Wow-thanks for offering this chance to win-the signs are wonderful! I would choose "Joy to the World!" I love the "Merry Little Christmas Sign"! Beautiful shop! What a great shop they have, Melaine! I love everything!! The Joy To The World really lifts my spirits! Thanks for a great giveaway! I love the sign Have your self a Merry Little Christmas sign...would love to have it!! Have Yourself a Merry Little Christmas!! I have been coveting one like it for a very long time. Have Yourself a Merry Little Christmas is my most Favoritest Christmas song. I love the sign... and I'm betting thtat's the one you have? Maybe? I also love the shed sign. I love the O Holy Night sign! Oh, what a fun giveaway! I really love the O Holy Night sign. I love "as for me and my house ..."
Love the "Oh Holy Night" sign, its just wonderful! Thanks for another great chance at a wonderful giveaway! I love the "Have yourself a merry little christmas" one!! The Merry Little Christmas Sign would look just right on my holiday mantle! I love the merry little christmas sign! What a great piece to put on my mantel! I would pick Have Yourself a Merry Little Christmas- my favorite Christmas song. I love them all, I'm a fan of Tara's signs. :) I would choose 'Have Yourself a Merry Little Christmas'. It's one of my favorite Christmas songs too. Thank you (and Tara) for the chance to win one of her beautiful signs! I would pick 'Have Yourself a Merry Little Christmas'. It's one of my favorite Christmas songs too!! Thanks for the chance to win! Love their signs! Thanks for the chance to win. Love the Have yourself a Merry Little Christmas sign. Definitely the have yourself a merry little christmas sign!!! So cute. 'Live Pure' is my favorite but they are all great! lovin' the red Joy to the World. The scripture signs are beautiful. Beautiful! I love "O, Holy Night" my favorite Charistmas carol. Thank you! The Merry Little Christmas sign for sure! So cute!! Just finished a Bible study by Beth Moore on "Fruit of the Spirit"...so that sign would be special to me! I would pick the "O Holy Night" sign! I love the red Joy to the World sign! I love the "O Holy Night" sign! i would love the family rules sign. that way i could see it every day, all year long! i love them all, actually!!!!! Seriously dying for one of their beautiful signs! Have your self a merry little Christmas is my fav! I love them all, but the Whole Heart sign is my favorite! My favorite has got to be the "Have yourself a Merry little Christmas"...and now the song is stuck in my head! Ahh Christmas hurry up and get here! Joy to the World.....in red. I love it! Have yourself a merry little Christmas wins hands down! I would adore the "Have yourself a merry little Christmas " sign! Thank you! oh, i realized it's a christmas sign give-a-way. have yourself merry little christmas would be my choice! Have yourself a merry little christmas sign. This sign would look so great in my entryway. I have really been wanting the "Sunshine Sign" for the longest time. It is so cute. I love it! I don't know if I can choose between the "Merry Christmas Sign" or the "Happy Holiday's Sign"
But I really do love them all!!! I like the Have yourself a Merry Little Christmas sign but it's hard since there is so many to choose from. Thanks for the givewaway. I think I would choose the have yourself a merry little christmas because it is so cute with the pop of red! Looks like it's a favorite among many! I adore, Have yourself a merry little Christmas! I would choose~ O Holy Night ~ as it is one of my favorite songs to sing during the Christmas Season!! Fabulous giveaway!! I love the Merry Little Christmas Sign. I love the Merry Christmas sign. I LOVE the scripture sign. All of the signs are beautiful!!! I love the Merry Little Christmas sign and the Joy to the world (red)sign. I love the Merry Little Christmas sign; love your blog! I love them all! I would love the "Merry Little Christmas" sign. [email protected] I love your blog! I love the black and white O Holy Night sign. Also love the Merry Little Christmas one for the porch. I love Oh Holy Night, it would be fun to use in a mantel display! I adore the 'Have Yourself a Merry Little Christmas' sign....so cute!! I love them all, but if I had to choose one, it would be the Have Yourself A Merry Little Christmas one. Thanks so much!! Seriously, I have to choose one? I guess I would choose the O Holy Night one. All of them are cute, but I really love the Merry Little Christmas one! I would choose the red "Joy to the World" sign! Love them all though! My favorite is O Holy Night. I also like My House (serve the Lord). I love all of them but the one that stood out was You have my whole heart for my whole life. I have my daughter, son-in-law, and 2 beautiful grandaughters living with us right now so the vertical family rules sign would be perfect! I would love the O Holy Night sign. I have always loved that song. I love both the Red "Joy to the World" and "Have yourself a Merry little Christmas" Oh... decisions, decisions. I love the Have Yourself A Merry Little Christmas sign!!! I love the "Have Yourself a Merry Little Christmas" sign. If I don't win it I may have to try to recreate it. I would love "Have Yourself a Merry Little Christmas." The song meant so much to me growing up. All are beautiful but I would choose 'Have yourself a merry little Christmas'. I like Have Yourself a Merry Little Christmas. I LOVE the "Oh Holy Night" sign. Honestly, everything in their shop is just beautiful!! I love the Have yourself a merry little christmas sign. They are all amazing. I love the HAVE YOURSELF A MERRY little CHRISTMAS sign. It would be great in my living room!! Wish me luck. Love the "Have yourself a merry little Christmas" 2x2. Adorable! I like the black and white Joy to the World! These are wonderful! Absolutely love the "Have Yourself a Merry Little Christmas" sign. What a wonderful and generous giveaway. Thanks so much for the opportunity! Love the "Oh, Holy Night...." sign. Beautiful. Love, Joy to the World..
"have yourself a Merry Little Christmas"! One of my favorite holiday songs! Love the Have Yourself a Merry Little Christmas!! I Love the Have yourself a Merry little Christmas Sign! Have Yourself a Merry Little Christmas is THE one! Love the "Have yourself a merry little Christmas" sign! I love them all! Especially the Holy Night one. My fav is "you have my whole heart, for my whole life". It just sums up my hubby & my marriage.....25 yrs & still going strong. "Have yourself a Merry Little Christmas." SO perfectly warm. simple. cozy. Love it. Oh my I think I'd choose the Whole Heart sign or the red Joy to the World sign. ok, this is almost impossible to choose, because they are all gorgeous, but I think I would have to go with the red joy to the world because it is so cheerful and my kids would love it. I really like the Have Yourself A Merry Little Christmas sign. I also like the scripture one a lot. So many pretty ones ! I LOVE the Joy to the World sign! I would choose a Merry Little Christmas. I LOVE their signs!! I would pick "merry little Christmas". Love them all!!! I love the Have Yourself a Merry Little Christmas sign....have been pining for it ever since I saw it. Thanks for the chance at a wonderful giveaway. I love the Have Yourself a Merry Little Christmas....have been pining for it ever since I saw it. Thanks for the chance at a great giveaway! I love the "I hope you dance" sign. This quote has helped me through the illness and death of my husband, my return to the work force and the raising of my son as a single parent. Joy to the World red sign is my favorite! Have Yourself a Merry Little Christmas - LOVE It! Have yourself a Merry Little Christmas - I Love it! I love the Happy Holidays sign! Thanks for the great giveaway! Love these signs! Love the vintage feel... Have a great day! I really like the 'oh holy night' signs and the fruit of the spirit sign. If I won though I'm sure I'd spend and agonizing amount of time deciding exactly which one I wanted! Would love to win - fingers crossed! Love them all!! But especially "I hope you dance..."
I think that all their signs are amazing. I'm thinking of getting one to put in our bathroom makeover. I just have to decide on which one - or custom. Love that custom quote sign!!! I love "HAVE YOURSELF A MERRY LITTLE CHRISTMAS". O Holy Night is my favorite Christmas hymn...so that's the sign I'd be honored to win! I love the Have Yourself a Merry little Christmas sign!! [email protected] -From Sara H.
Love them all! But if I had to pick a 2x2 I would love the "have yourself a merry little christmas" sign! I love her signs. The Merry Christmas sign is wonderful! Thanks for the chance. I love her signs and THANK YOU! for a chance to win one...I LOVE the "Joy to the World"
Ooo, what a fun giveaway! Thank you so much! :) I'd like the "Have Yourself..." or the "O Holy Night" sign, if I were to win, please. Thank you! Happy November! They are all fabulous!!!!!! But if i must choose i pick the merry little christmas sign! Lovely signs. I would pick Merry Little Christmas Sign. Beautiful signs! I would love the "Home is wherever I'm with you" sign. Thanks for the chance to win! I love the "Have yourself a Merry Little Christmas" sign! I love the 'Joy to the World' sign! I love your blog and I peek in here often. Love 'snooping' around your home and blog. I love the 'Joy to the World' sign. Perfect for my front porch and a real declaration of the reason for the season! These are lovely! I would love the Happy Holidays sign and also love the Cities sign where I could list all the places we have lived over our 32 years together. Love that one for year round enjoyment too! I like the "My House" sign. Lovely. I love the Happy Holidays sign! Its all the beautiful parts of Christmas on one sign. Love these graphic signs!! My favorite is the "Have yourself and merry little Christmas". I would hang it on my front porch...just between you and me I am getting just a little tired of wreaths. I really need that red Joy to the World sign!!!!! really need it!! I really like the "Have yourself a merry little Christmas" sign. I have the perfect spot on my front porch. I love the Oh Holy Night sign. Gorgeous script and the sweetest message of them all!! Have yourself a merry little Christmas! Love it! Awesome giveaway ~ thanks for the opportunity to win! I would choose the "Have yourself a merry little Christmas"
I want all of them!! ...but if I had to choose it would have to be the Have yourself a merry little Christmas sign!! "Joy to the World"...hands down...in RED!! I love the Christmas ones!But, It would be a hard choice! Definitely the Family Rules sign. It would look awesome hanging on my wall in the dining room. Great Etsy shop. Thank you for your giveaway. Thanks for introducing me to this shop. I would probalby choose the one about home is wherever I am with you. The red Joy to the World Sign is great! Their signs are beautiful-all of them!